1.1.Approach I : From your admin dashboard. 4.How to Import Demo Data? 6.1.How to set Homepage setting? Click Browse. Locate blog-lover-pro.zip theme in your computer. Select blog-lover-pro.zip and click Install Now. You can use FTP client like FileZilla to connect your web server. Unzip blog-lover-pro.zip to your Desktop. Using an FTP client to access your host web server, go to /wp-content/themes/ and upload your new copy of Blog Lover Pro theme. Now, the theme will be activated and go through the following options to set up the theme step wise. After successfully installing the required theme, you need to activate your theme. Follow given steps to activate the theme. 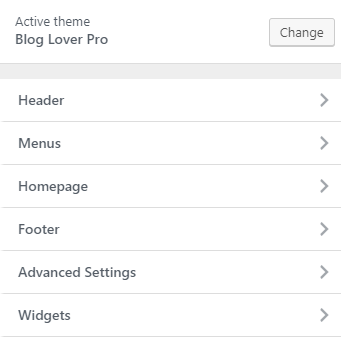 You will see the Blog Lover Pro theme on the list. After clicking the Activate button the theme will be activated. 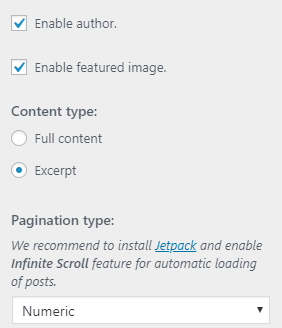 Jetpack: To configure Infinite scroll on then Blog page and All Archive Pages. 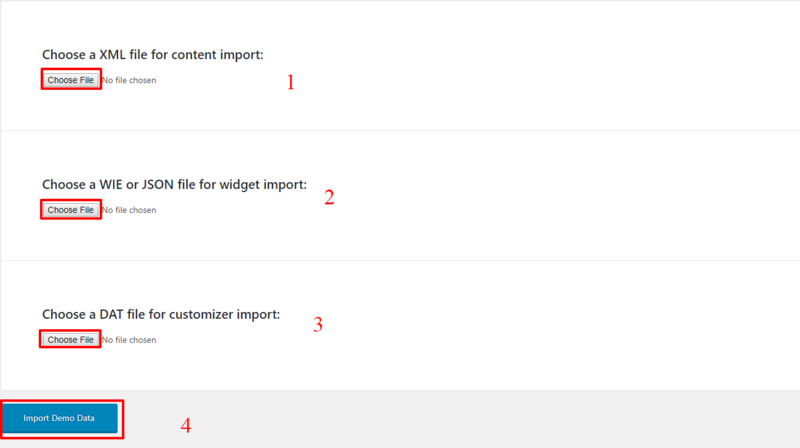 One Click Demo Import: To import the demo data. This plugin is highly recommended plugin to import the demo data. First Install One Click Demo Import Plugin and active this plugin. Then click Import demo data button. When You import the data then automatic setup demo for this theme. Click Switch to manual import! to import manually. Click Choose File of Choose a XML file for content import. Then Choose our theme data file from Store-Mall-Pro (Theme Name) > Demo > content.xml file. Then Choose our theme data file from Store-Mall-Pro (Theme Name) > Demo > widgets.wie file. Then Choose our theme data file from Store-Mall-Pro (Theme Name) > Demo > customizer.dat file. Note: You need to import demo data in fresh WordPress otherwise existing posts, pages, categories, images, custom post types or any other data will be deleted or modified. 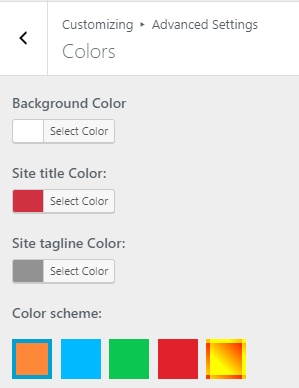 The customizer lets you add, modify, enable or hide various features of the theme. The above sections are described below. From Customize section > Header > Header. 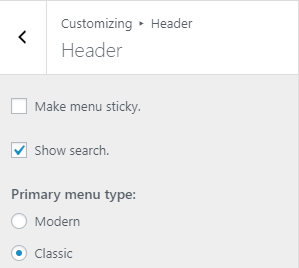 Make Menu Sticky : This option is for menu sticky. If menu sticky is enable then the menu is fixed when user scroll. Show Search : This option is for Search Option. If Show Search is enable then search icon is display in heade menu. Primary menu type: There are two type of menu type. Morden: This menu look like mobile menu. You can choose one of those menus. How to manage Site Title, Logo, Tagline and Site Icon? 1. From Customize section, go to Header > Site Identity. Logo( Only available in WordPress version greater than or equal to 4.5 ): It changes the main logo of the site. Site Title : It changes the main site title of the site. Tagline : It changes the tagline (i.e:Description) of the site.Just below site title. 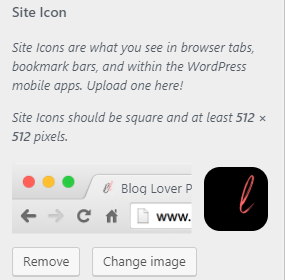 Site Icon : The Site Icon is used as a browser and app icon for your site.Icon must be square and at least 512px wide and tall. Note:Theme has two menu location provided as Primary, Topbar, Slider Menu and Social. Once, you have created the menu, you can further add items to the menu. You can choose menu location. There are 2 locations Primary Menu and Social Menu. You can choose one of them location. To create menu, you need to go to Admin Panel / Appearance / Menu . 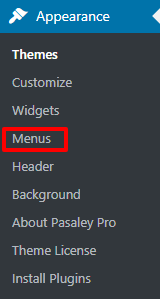 You need to create menu from / Customize / Menus / Create Menu . You can create more menus in similar way. After creating menu, you need to add pages to that menu. 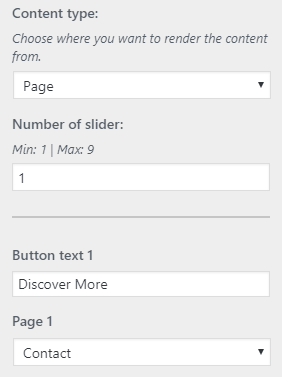 To add pages to the menu, you need to create some pages (For e.g: “About Us” , “Contact”). 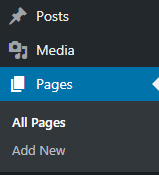 After creating pages you need to add that pages to the menu. 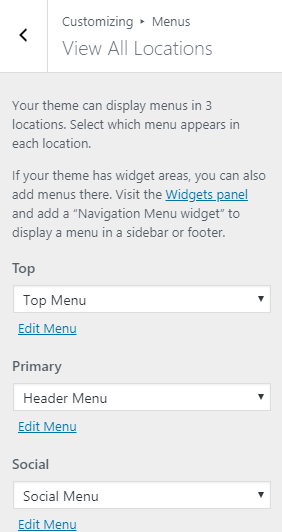 After you added the pages to the menu set the menu location from / Customize / Menus / Menu Locations /. These are homepage demo setting options as shown below. From Customize section, go to Homepage > Homepage Setting you will see option. 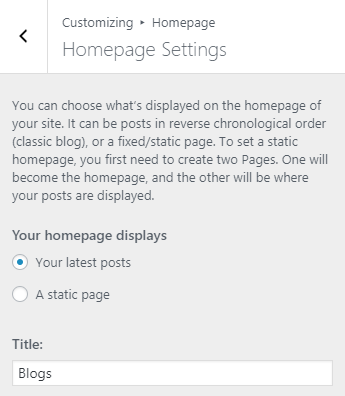 Choose A static page option under Your Homepage displays title. 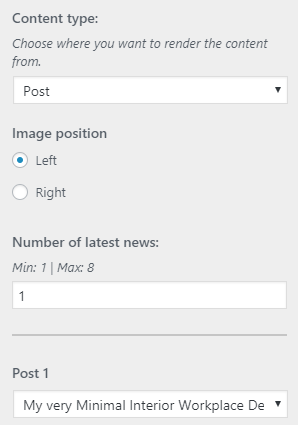 You will be able to set any page as a static front page and blog page as shown on the image below. 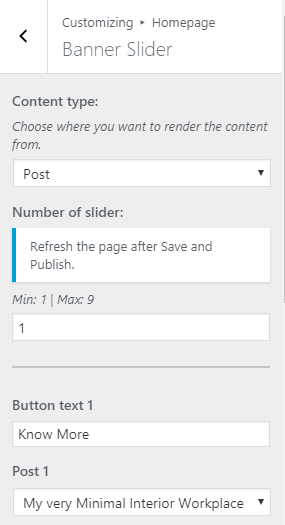 Click Save and Publish button to save changes. Note: If you select Your latest Posts, then all the posts will be displayed in your frontpage. 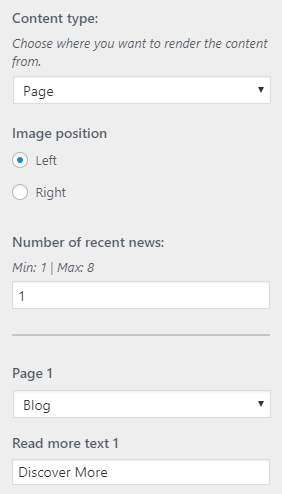 If you select A static page, then your frontpage will display the content from the page you selected as Front Page. 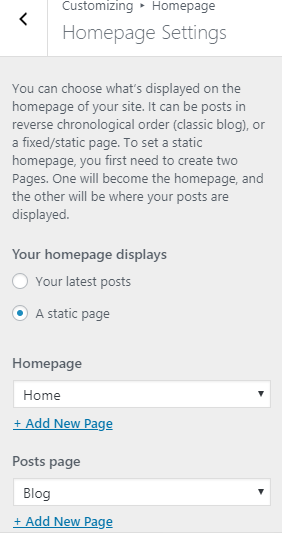 However the page you selected in Posts Page will become your blog page. 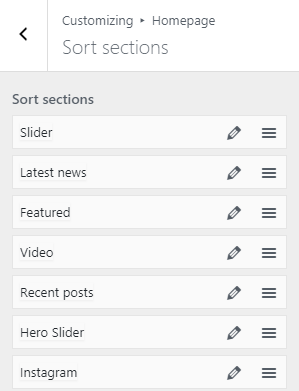 From Customize section, go to Homepage > Sort Section. In this Option you can change position of section. If you want Latest section is below of Featured section you can drag Latest and drop on below Featured section.Then Latest section is placed in third place in home page design. The demo of the front page can be divided into different sections as shown below. 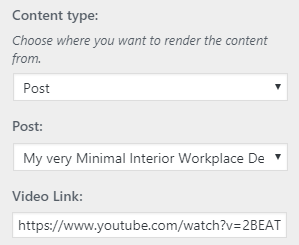 Content Type:Select Page / Post / Category / Custom to enable this section or Select to Disable option to disable this section. 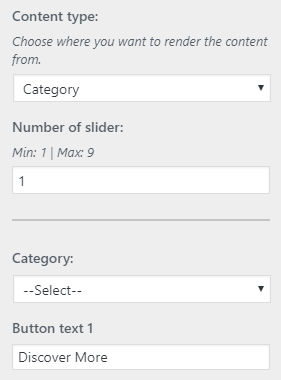 Number of slider: Set Number of Posts of the section. Select Content Type:Select the type of content you want to show. Post:When Post is seleced as the content type of this section then Feature image and content are displayed of this post. And you will see these options. Button Text: Set button text of the button. Select Post: Select one of the post from drop-down lists of posts. Page:When Page is seleced as the content type of this section then Feature image and content are displayed of this Page. And you will see these options. Select Page: Select one of the Page from drop-down lists of Pages. Category:When Category is seleced as the content type of this section then Feature image and content are displayed posts of selected category. And you will see these options. Select Category: Select one of the Category from drop-down lists. 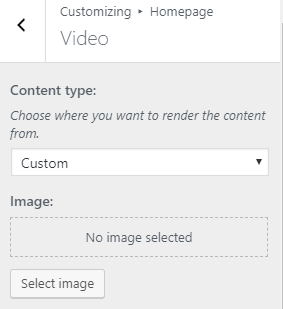 Custom:When Custom is seleced as the content type of this section then Feature image and content are displayed. And you will see these options. Select Image: Upload image as the feature image of this section. 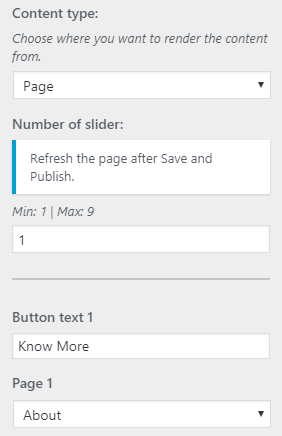 Content: This option allows to change or set the short text on the hero content section. Button Link: Input the link of the content. Number of Posts: Set Number of Posts of the section. 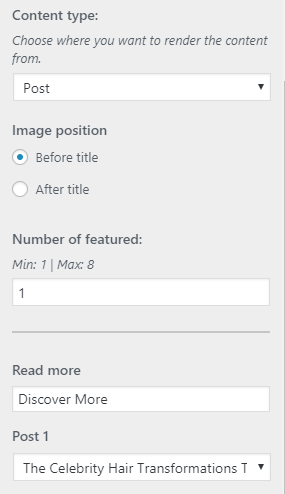 Image position:Select the image position of the section you want to show. 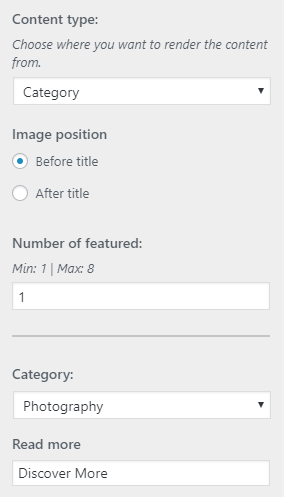 Before Title: If you want feature image of the section is placed in Before Title position then you must select right option. 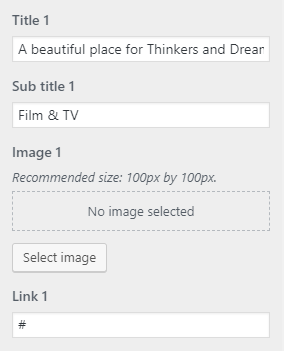 After Title: If you want feature image of the section is placed in After title position then you must select left option. Tilte: This option allows to change or set the title. 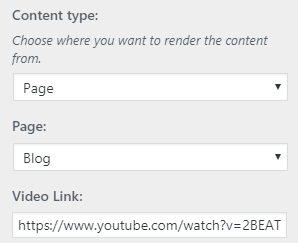 Link: Input the link of the content. Page: When Page is selecet as the content type of this section then Feature image and content are displayed of this Page. And you will see these options. 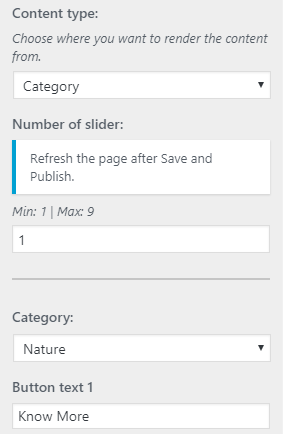 Content Type: Select Page / Post / Category / Custom to enable this section or Select to Disable option to disable this section. 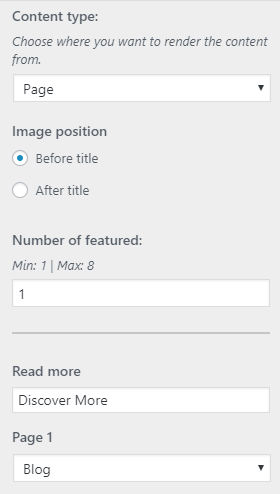 Image position: Select the image position of the section you want to show. 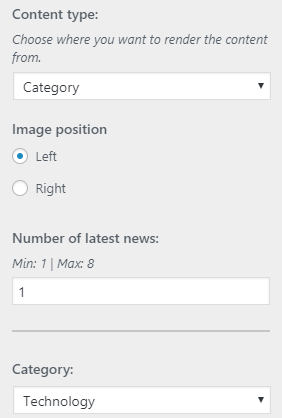 Right: If you want feature image of the section is placed in Right position of the section then you must select right option. 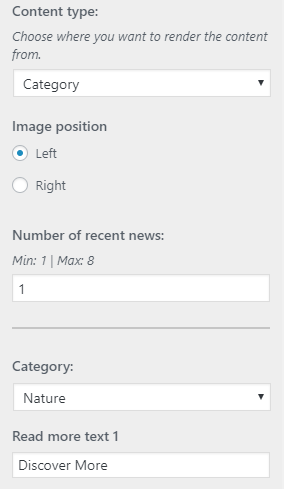 Left: If you want feature image of the section is placed in Left position of the section then you must select left option. Select Content Type: Select the type of content you want to show. 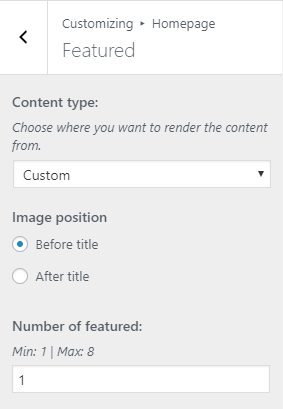 Custom: When Custom is seleced as the content type of this section then Feature image and content are displayed. And you will see these options. Title: This option allows to change or set the title. Sub Title: This option allows to change or set the sub title. Read More Text: Set Read more text of the post. Content: Set short content of the post. Page:When Page is selecet as the content type of this section then Feature image and content are displayed of this Page. And you will see these options. Category:When Category is selecet as the content type of this section then Feature image and content are displayed posts of selected category. And you will see these options. 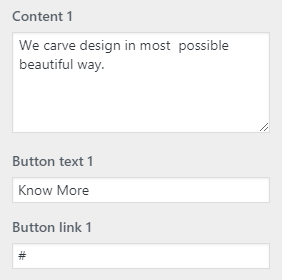 Content Type: Select Page / Post / Custom to enable this section or Select to Disable option to disable this section. 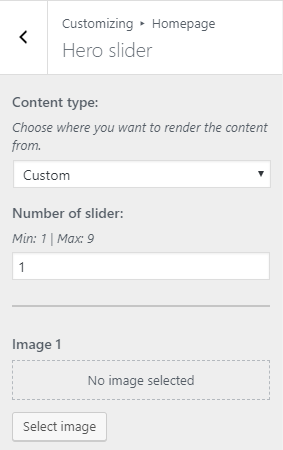 Custom: When Custom is select as the content type of this section then Feature image and content are displayed. And you will see these options. Sub Tilte: This option allows to change or set the sub title. 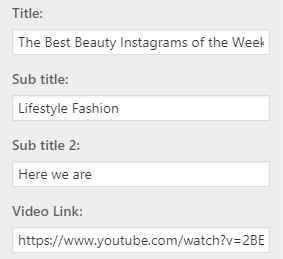 Sub Tilte 2: This option allows to change or set the sub title. Video Link : This option allows to set video link. Content Type:Select Page / Post / Category to enable this section or Select to Disable option to disable this section. Post:When Post is selected as the content type of this section then Feature image and content are displayed of this post. And you will see these options. Page:When Page is selected as the content type of this section then Feature image and content are displayed of this Page. And you will see these options. Category: When Category is select as the content type of this section then Feature image and content are displayed posts of selected category. And you will see these options. 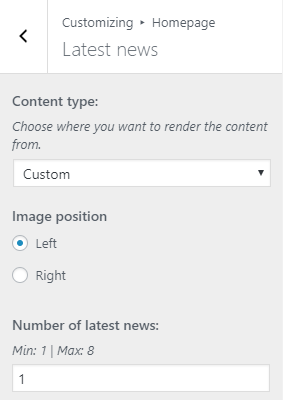 Custom: When Custom is selected as the content type of this section then Feature image and content are displayed. And you will see these options. Content: This option allows to change or set the content. 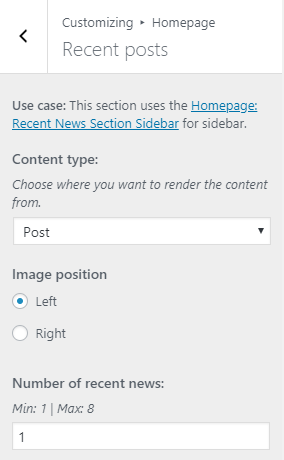 Post: When Post is selected as the content type of this section then Feature image and content are displayed of this post. And you will see these options. 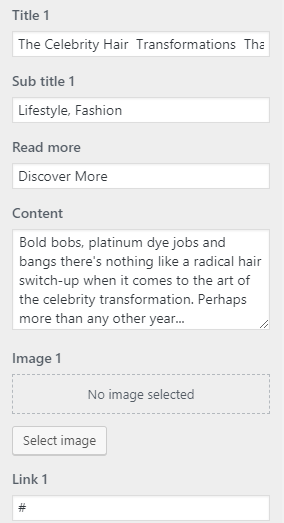 Page: When Page is selected as the content type of this section then Feature image and content are displayed of this Page. And you will see these options. 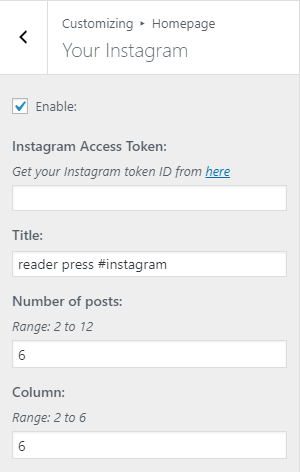 Instagram Access Token:: Get your Instagram token ID from given link. Number of Posts : Set Number of posts of the instagram account. Number of column : Set Number of column of the section. From Customize section > > Footer Section. 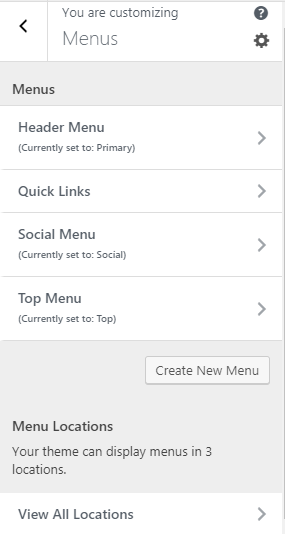 Display Social Menu: Check to enable on theme option otherwise Uncheck to hide. This allows user to show footer Social menu weather on static front page or on entire-site. Display Footer Text: Check to enable on theme option otherwise Uncheck to hide. This allows user to show Footer Text weather on static front page or on entire-site. 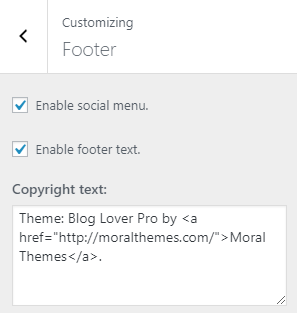 Copyright: This changes the copyright text of Footer Content. From Customize section, go to Advanced Setting > Colors Now, you will be able to change the color options. Once, the preview is fine you can save and publish it. Background Color: This changes the background color of the site. Header Text Color: This changes the header text color. Color scheme: You can change theme color from this color option. 1. 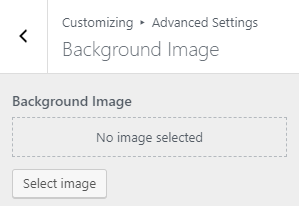 From Customize section, go to Advanced Setting > Background Image. Now, you will be able to change the background image options. 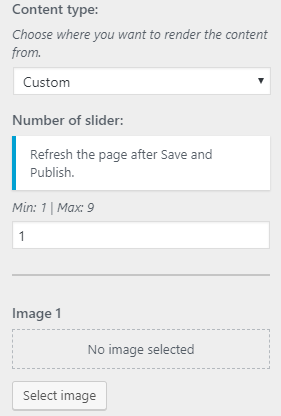 Once, the preview is fine you can save and publish it. This will change the background image for the entire site. From Customize section > Advanced Setting > General. 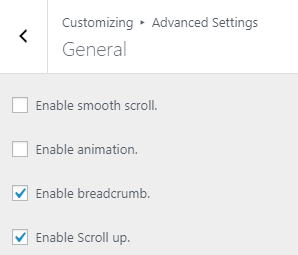 Enable Breadcrumb: Check the option to set or display Breadcrumb otherwise uncheck. Enable Scroll up: Check the option to set or display Scroll up otherwise uncheck. From Customize section > Advanced Setting > Global Layout. Site layout: This option works on whole site. You can choose either Boxed or Wide or Frame site layout. 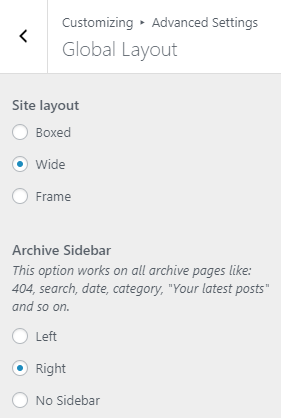 Archive Sidebar: This options works on all archive pages like: 404, search, date, category, blog and so on. You can choose either Right sidebar or Left sidebar or No Sidebar. 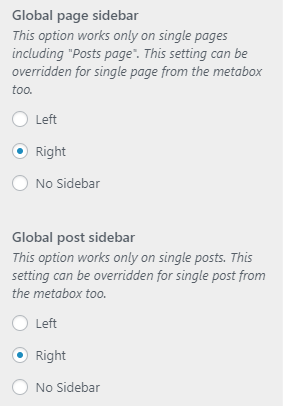 Global post Sidebar: This options works only on single posts. This setting can be overridden for single post from the metabox too. You can choose either Right sidebar or Left sidebar or No Sidebar. 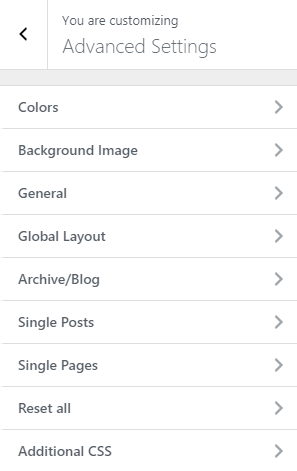 Global Page Sidebar: This options works only on single page. This setting can be overridden for single page from the metabox too. You can choose either Right sidebar or Left sidebar or No Sidebar. From Customize section > Advanced Setting > Archive / Blog . Excerpt more text: Set the Excerpt more text on excerpt. 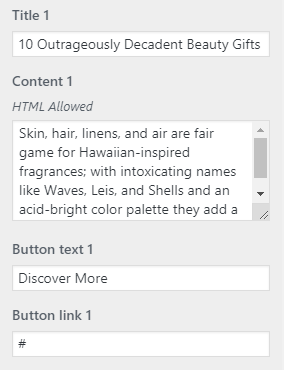 Excerpt length: Set the excerpt length of excerpt content. 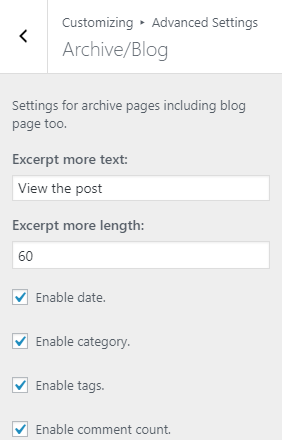 Enable Date: This option allows user to enable/disable date assigned in blog post. Enable Category: This option allows user to enable/disable category assigned in blog post. Enable Tag: This option allows user to enable/disable tag on blog post. 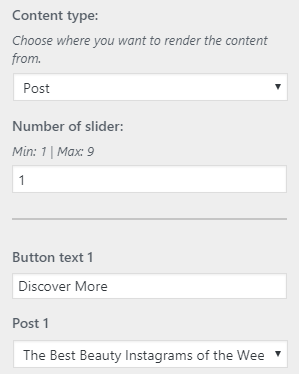 Enable Comments Count: This option allows user to enable/disable comment count on blog post. Enable Author : You can Enable the author image on blog, archive and search page. Enable Feature Image: This option allows user to enable/disable feature image assigned in blog post. Excerpt: This option allows user to set the excerpt length. Full Content: This option allows user to set the full content of blog post. Numeric : This is for numeric pagination option. Older Posts/Newer Posts : Default pagination option. 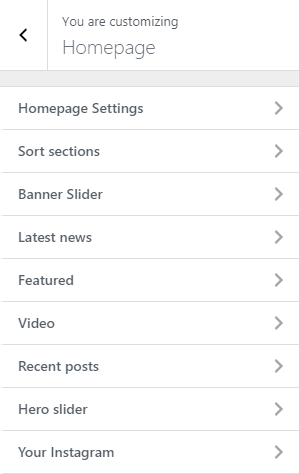 Infinite Scroll : This options allow to show infinite number of posts on scroll. This option working when Jetpack plugin is active. If you want Disable the pagination then choose disable option. From Customize section > Advanced Setting > Single Posts. Enable Date: This option allows user to enable/disable date assigned in Single post. Enable Category: This option allows user to enable/disable category assigned in Single post. Enable Tag: This option allows user to enable/disable tag on Single post. 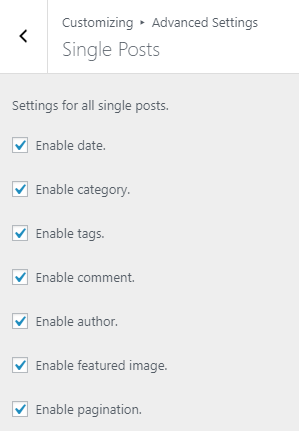 Enable Comments : This option allows user to enable/disable comment on Single post. Enable Author : You can Enable the author image on Single post. Enable Feature Image: This option allows user to enable/disable feature image assigned in Single post. Enable Pagination : This option allows user to enable/disable Pagination on Single post. 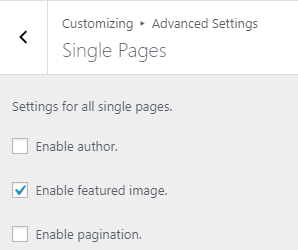 From Customize section > Advanced Setting > Single Pages. Enable Author: You can Enable the author image on Single page. Enable Feature Image: This option allows user to enable/disable feature image assigned in Single Pages. 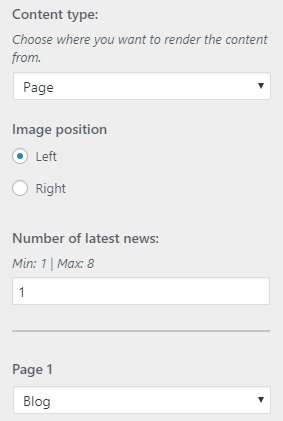 Enable Pagination: This option allows user to enable/disable Pagination on Single Pages. 1. 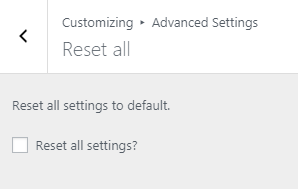 From Customize section, go to Advanced Setting > Reset all. Check to reset all settings: Check the Check to reset all settings and refresh the page to reset all theme settings to default. 1. 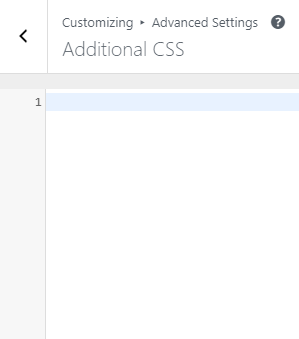 From Customize section, go to Advanced Setting > Additional CSS..
You can add your own CSS here. Widgets are one of the most important aspects of this theme. Three special widgets are specially built for the front page so that most of your content can be categorized easily and be accommodated to feature in the front page. Footer Widgets: These widgets are used in footer section. Sidebar: This sidebar is default sidebar area. This sidebar area is dispaly at blog page, single blog pages, pages. 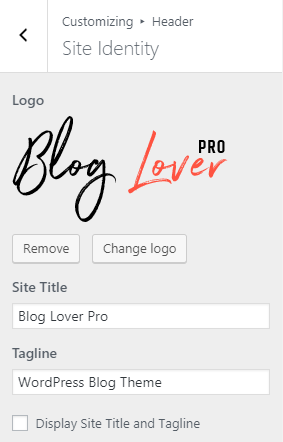 Using an FTP client to access your host web server, go to /wp-content/themes/ and upload your new copy of Blog Lover Pro theme which shall replace the old files.